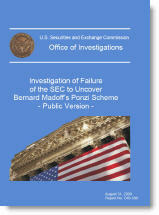 This entry was posted on Wednesday, June 23rd, 2010 at 8:35 am and is filed under Securities and Exchange Commission. You can follow any responses to this entry through the RSS 2.0 feed. You can leave a response, or trackback from your own site. Thanks for pointing this out. We received it at our library and I never noticed it. Strange. I no longer see the ads. I’m also slightly embarrassed to have mistyped “wonderin” in my previous comment. Carry on! We’re a Government blog — no ads here! I’m not sure what you saw, but we don’t and would never do that. This is great! I’m wonderin, however, why you have Google ads on this blog? General openess perhaps, but why then do people not trust the government? An excellent point and one which seems to get lost in the overall negativity in the press and Main Street USA. The United States may have its problems but it is important to remember the level of open communication that generalizes this nation.